MyWay Mobile Storage is pleased to support the Pennsylvania American Legion Housing for Homeless Veterans Corporation in their efforts to provide transitional housing for veterans. 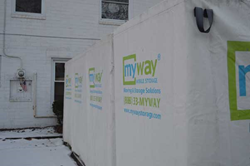 MyWay Mobile Storage units at Cypress Street Housing for Homeless Veterans location. In 1988, Pennsylvania American Legion Housing for Homeless Veterans Corporation purchased four town houses on Cypress Street, Moon Township in Allegheny County. The concept is simple — provide a safe, clean, stable environment for the participant while he or she completes schooling, job training and becomes adequately self-sufficient to seek permanent housing in the surrounding community. The Cypress Street Project quickly received national attention and has served as a basis for many similar projects in the Pittsburgh area and throughout the country. The remodeling and upkeep of these homes is the responsibility of the Corporation. “We renovated 4 units that house 10 Veterans who need our support to get their lives back on track,” said Christina Lonigro, a Housing for Homeless Veterans Corporation 2014 honoree. The program is designed to enhance the quality of life for the veteran. The goal is to become productive tax paying citizens by securing a good decent job. MyWay Mobile Storage is the leading provider of moving and storage solutions and located in a spacious 27,500 square foot facility in West Mifflin, PA, to better service their customers in the metropolitan Pittsburgh area. They provide quick and easy do it yourself moving containers that can be delivered right to your door and stored in their climate controlled, secure storage facilities. To learn more, visit http://www.mywaystorage.com or call 888-336-9929 to speak with a Moving & Storage Consultant.